« First Ever Successful Prediction of GMT! 3 Years Done! Figure 1. 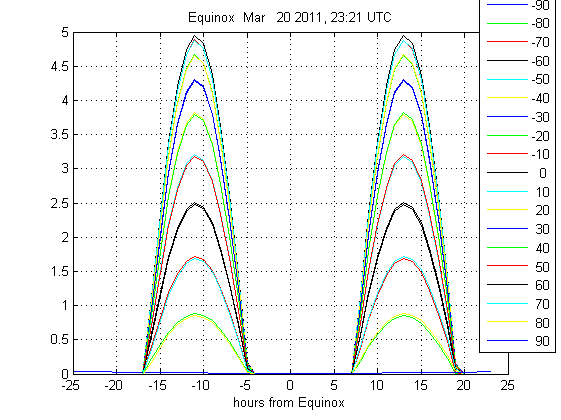 Insolation at Greenwich meridian during Mar 2011 Equinox, time from (4), (per latitude, time resolution 1 hour). Figure 2. 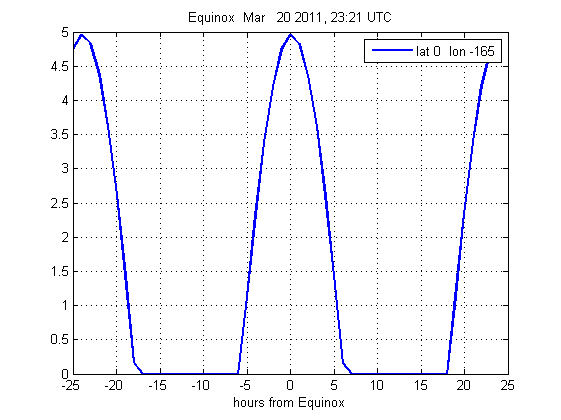 Insolation at 165 West longitude, 0 latitude, during Mar 2011 Equinox, time from (4), (time resolution 1 hour). Figure 3. 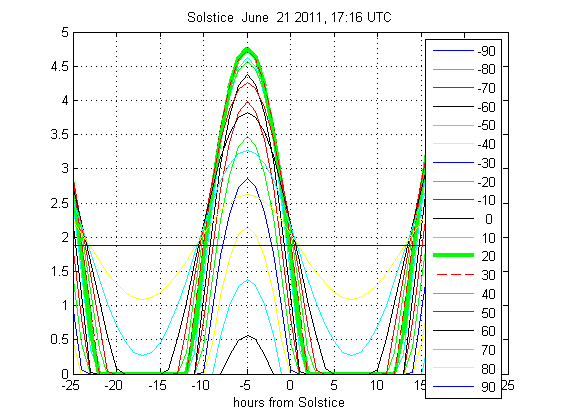 Insolation at Greenwich meridian during June 2011 Solstice, time from (4), (per latitude, time resolution 1 hour). 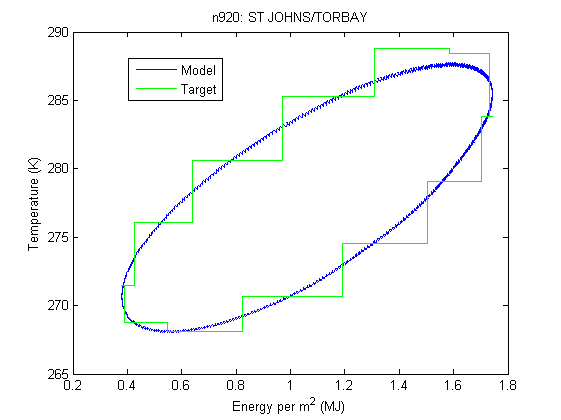 Finding the parameters was then just a minimization problem, using Jones 90 data as reference for the t(k). Jones data is monthly data so monthly means of t(k) were used for minimization. 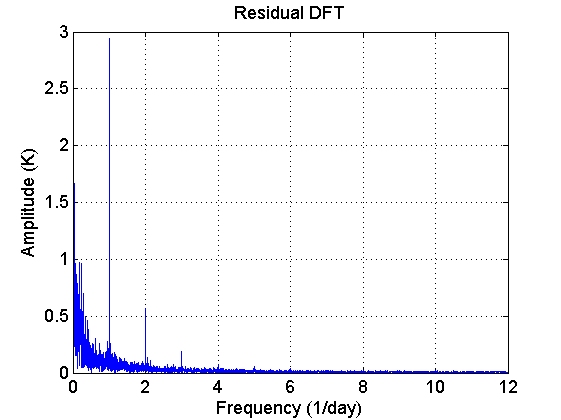 Result from one randomly picked station shown in the figures below. Is this model useful? Don’t know yet. 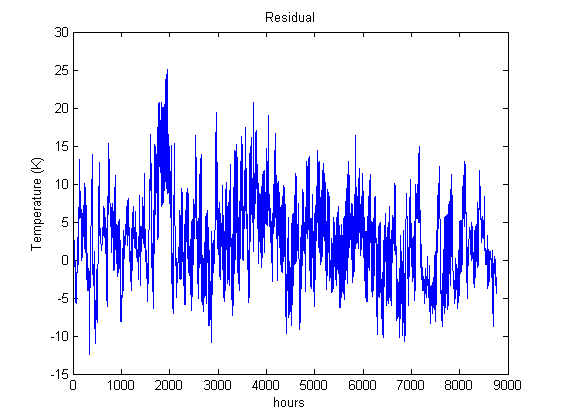 Next step would be to add white noise to s(t) and find out if the model can produce local time series with similar autocorrelation properties as real observations. 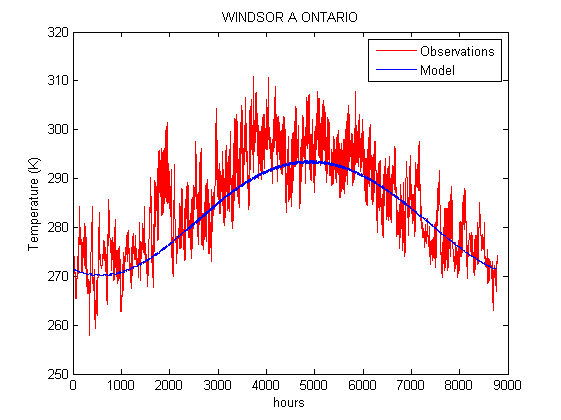 Or see if changes in insolation agree with the results that physical climate models give. 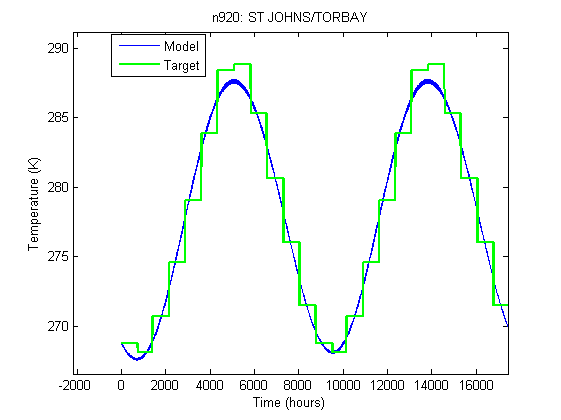 Or generate one Kalman filter for each station and see if they together can predict GMT anomaly. But the main reason was just to try to find one way to explain the phase differences, and that task was accomplished. There is quite a lot of parameters to fit, but if I leave constant part out (the model now works with Kelvins that agree with reality) I get similar results with an IIR filter that has 3 parameters per location. This entry was posted on March 19, 2014 at 11:55 am and is filed under Climate. You can follow any responses to this entry through the RSS 2.0 feed. You can leave a response, or trackback from your own site.